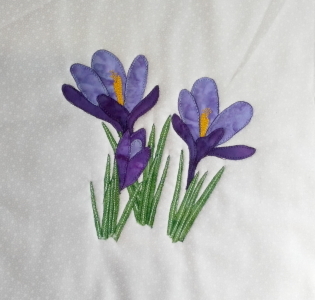 Applique Crocus Block » What's Under the Needle? I've mostly seen purple or mauve crocuses but there are also yellow and white ones too. I decided to use purple fabrics to create my block. 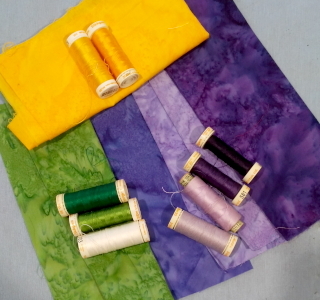 I selected some fabrics and threads to get started. I drew all the individual pieces onto fusible webbing - fusing the pieces makes it so much easier when dealing with small pieces and because I had drawn all the pieces in reserve for the pattern, it was easy to trace them right off the template page. You can see I only need scraps of fabric to make this! 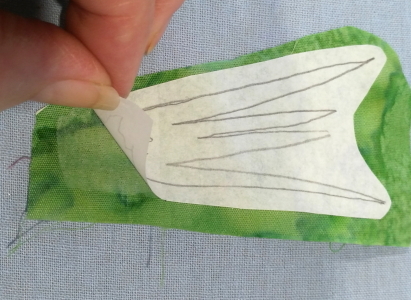 Here's one tip I like to share when using fusible webbing. If you're like me, sometimes you find it difficult to get the backing paper off after the pieces are cut out especially when they are very small or skinny pieces. What I do before cutting the piece out is lift the paper backing up just a little way, then hold it back down to cut out the shape. It's important not to remove it completely otherwise the paper moves around too much. With the backing paper slightly lifted in one area, I now have a starting point to grab and don't have to spend ages trying to separate the two pieces. 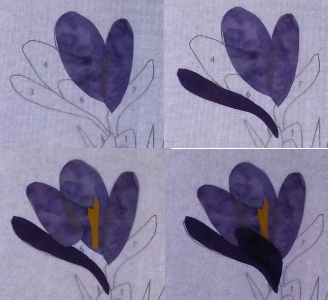 It's fun watching the applique grow... I build the flowers individually first on a Teflon sheet. They are much easier to position on the background this way. I often make adjustments as I work along and here's one good example of that. 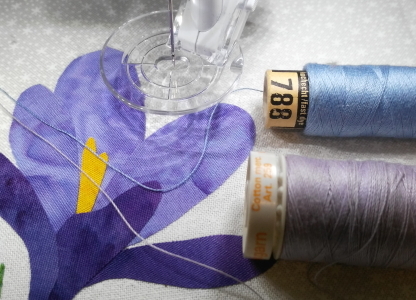 In my original selection of threads, I thought I had a pretty good thread for the light purple but under the light of the machine, it really wasn't. I decided to select a more bluish thread as it blended into the fabric better as you can see in the photo below. If you cannot find the right color, it's better to select one that is slightly darker. 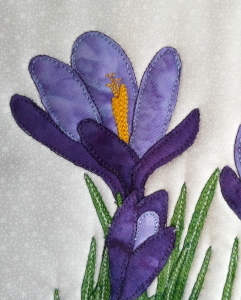 I love the stitching part, this is my favorite as you can see the flower coming to life. I agree, hand applique is nice and very relaxing, I do enjoy doing it, just don't have time, unfortunately. Fusible is my thing, I've been using it for years. 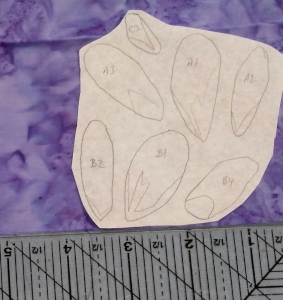 Just remember to use the lightweight fusible for applique. Ruth so glad you use fusible! I was going to do that too, I have a few picked out to get and waiting to hear from Jeremy about what kind of flower Meredith likes. I took a class in hand applique last month, and nice, but not really for me!